Nicolas Godin, one half of the French duo Air, sounds like he’s speaking from a monkey cage. In reality, he is in the lobby of a hip New York hotel after having spent hours with his other half, Jean-Benoît Dunckel, convincing passport control they are not the thieves of their own passports which were stolen a few years back. From one monkey cage to another, the best thing the two can do is go up to their rooms, put on their new album, Pocket Symphony, and let its gentle, orchestral movements and soothing tones smooth away the friction. Under The Radar: Pocket Symphony is a return to your initial sound with more instrumentals and less vocals. Was this intentional? 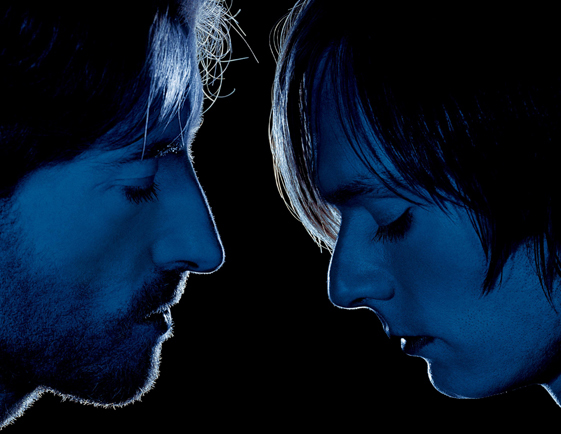 Nicolas Godin: Before we did this album, we did an album for a singer called Charlotte Gainsbourg and it’s only songs. After Charlotte, we were fed up with songs. We were more into instrumental music because we worked a lot with structure: verse, chorus, verse, chorus, that’s it. UTR: How did working with Charlotte Gainsbourg come about? Jean-Benoît Dunckel: Nigel Godrich and Nicolas met Charlotte at a Radiohead show. Nicolas and me, we did a sort of fake remix of a track of a track of Charlotte Gainsbourg. Nigel heard it and said you should do something with her because her voice is going very well with your music. That’s what he told Charlotte and she said I’m dying to do my album, but I don’t know how and with who and I love you and I love Air music so let’s try to do it. It’s really successful in France. It’s funny because it’s English lyrics and people love it. UTR: Through the Gainsbourg album is also how you ended up working with Pulp’s Jarvis Cocker and The Divine Comedy’s Neil Hannon, who are featured on Pocket Symphony. Dunckel: They were only lyricists for the Charlotte Gainsbourg album. For our album we wanted to use a voice because they have good voices. Especially, it brings to our album a kind of a male attitude which is really important, because when we sing high it sounds like girls. It’s another type of sound and it’s good for the album. On our albums there is a sort of an African beat style in the background of the music because we played with Tony Allen from Fela Kuti and he’s a really good drummer and he has a very unique style and it fits well [for] our music too. UTR: Did you record them, or did they send you their vocals? Dunckel: They came in the studio and we recorded with them. Neil we recorded in London and Jarvis Cocker we recorded in our little studio in France. He came over. He did the lyrics in one afternoon. He was really passionate. The takes that we kept, maybe the second one or third take, it’s really sensitive and it goes very fast. UTR: Had they heard the music before? Dunckel: [Cocker] just came and we played the music. Neil is another story because the song has been made for Charlotte Gainsbourg and she didn’t want to use it for her album, so we changed the key of the song and we recorded a new version with Neil. UTR: The whole album has a humorous tone in its lyrics, but both Cocker and Hannon sound miserable. Godin: I have no idea what they’re talking about. That’s the charm of it. In France, we don’t listen to the lyrics of the song. UTR: But you still preferred to have more instrumentals than vocals on Pocket Symphony? Dunckel: Just to have some diversity on the album, not too much singing because the world is too heavy. For example, the instrumental “Lost Message,” it was a song before but it was more interesting to keep it as an instrumental. Also, a voice is such a strange instrument, why always using a voice? I guess that we are appreciated for the medicinal aspect for our music. It can cure people because they can really relax, space out on the sound. So when it’s too heavy, when there are too many informations with words, the brain can’t follow so far. Sometimes you just have to be there enough. UTR: Why did you decide to include traditional Japanese instruments (koto, shamisen) on Pocket Symphony? Godin: I was in love with a girl and she told me to do that one night. I felt inspired and we did it. Kind of a sentimental thing. It sounded like a good idea. UTR: When boys like girls they do a lot of things they wouldn’t normally do. Godin: Exactly. When we started music it was just to impress girls. Same old story. She made me think about a lot of things about this country. The only way for me. Because I’m good at music, it was my way to be into it. It is what I’m best at. Godin: No she was French. My teacher was Japanese. UTR: Why did you decide to take the time to learn the instruments instead of just hiring an expert to play them? Godin: Because I wanted to do kind of a self-cure. You know when you try to make some yoga. If you learn this instrument, it’s like a whole new balance in your life. You go in a pattern every week. It’s great. It really gives a new perspective. I remember when I was a kid and I was touching a guitar. The first time I was so excited about it, I couldn’t believe it. But you lost the feeling because you’ve been touching a guitar for 20 years now. Suddenly this Japanese instrument, and you realize everything can start again. Such a good feeling. UTR: So you’re refreshing yourself? Godin: Exactly. Especially since they have new harmonies, new scales, so you don’t even have the same melodies with this new feeling. Godin: It was kind of hard because this type of music you can do some simple things and be very satisfied. UTR: Did already knowing how to play some instruments help you to learn or it’s completely different so it’s actually harder? Godin: It’s hard to play it well. I will say, to do some of it is pretty easy and instinctive but if you want to do it the right way, it’s really difficult to position your body and the energy and your fingers. You have to concentrate and be focused on it really. You have to make the right sounds. The process is more interesting than the result sometimes. That’s what we feel.